Two South African players scored five of the team’s 10 tries, and the Springboks took complete control of the second half and buried the U.S. Eagles 64-0 in the Rugby World Cup. Bryan Habana, a South African back, scored three tries and Francois Louw, a forward, also put in two five-point tries. 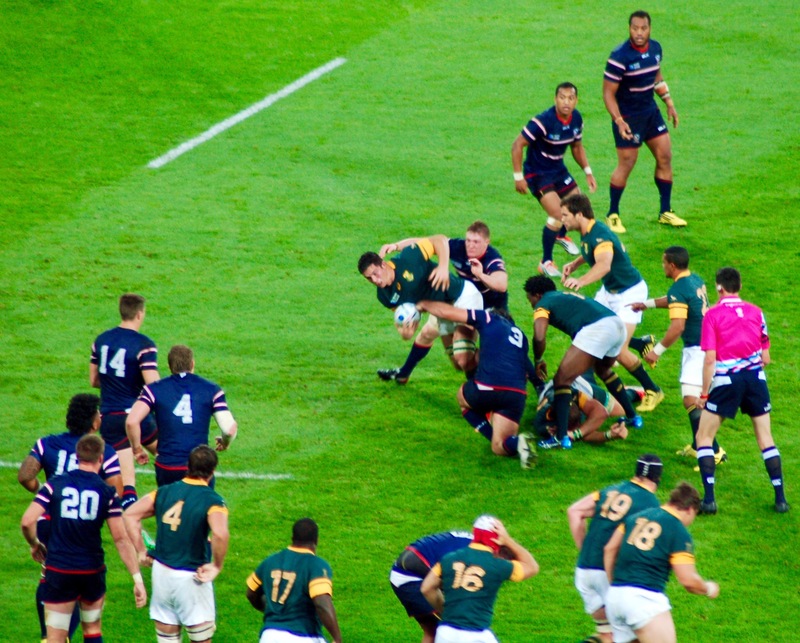 A Springbok forward pushes U.S. defenders back. Four other Springboks collected tries with the 10th one coming from a penalty try awarded for the U.S. team collapsing the scrum. The Springbok dominated in all phases of the game, and the Eagles rarely had possession of the ball and never produced anything from it. A last-minue spurt by the U.S. ended with Lwazi Mvovo kicking a dropped U.S. pass into open space and going 70 yards for one more horror in a house of them for the Eagles. South Africa easily picked up the bonus point for scoring four tries and will finish as the winners in Pool B over Scotland, who play Samoa on Saturday. Even with a bonus point on Saturday for Scotland, it would fall a point short of South Africa’s total. The Springboks will have to wait until the Australia-Wales games on Saturday to see which one finishes as Pool A runner-up and will meet the Springboks in the quarter finals. Posted on October 7, 2015 October 7, 2015 by jbsaulPosted in UncategorizedTagged rugby, Rugby World Cup, RWC, South Africa, Springboks, USA Eagles.